The Question: Top ten characters we’d name our children after. 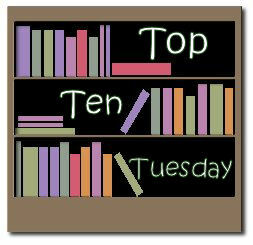 The Answer: Every now and then a topic is presented for Top 10 Tuesday that can cause (how can we put this delicately), slight differences in opinions. We’re not saying the topic for this week falls into this category; however we will admit that voices were raised... As you can imagine, the below 10 answers may vary greatly depending on which Bibliomaniac you ask. Scout – (To Kill a Mockingbird) – There’s no debate on this one, our favorite child name from all of literature (Probably). Rhett – (Gone with the Wind) – Frankly, we don’t give a darn – we’re choosing this name. Georgia – (Angus, Thongs and Full-Frontal Snogging) – Maybe not the attitude or the drama, but as for her name, she passes our test. Adéle – (Jane Eyre) – Doesn’t it just roll off the tongue. Plus, we’ll take the French accent as well. Tristan – (Stardust) – Okay, his name from the book is actually Tristran, but in the movie it’s Tristan so that should still count, right? Pippin – (Lord of the Rings) – Easily our favorite name from all of middle earth. Yvaine – (Stardust) – High points on the uniqueness yet practical scale. It might take some getting used to but we could see a little Yvaine running around the house. Gale – (The Hunger Games) – If we had to pick a team in the series we were probably team Peeta, although for a child’s name, we’re team Gale all the way. Lisbeth – (The Girl with a Dragon Tattoo) – So far we have mixed feelings on this review and by mixed we mean that one of the Two Bibliomaniacs didn’t like it. As soon as the second Bibliomaniac finishes we’ll post our official position. Still, we liked the name. Dickon – (The Secret Garden) – While we probably wouldn’t pick this name for our child, we do want our next boy to be just like him. Scout and Lisbeth made my list, too. :) Pippin is such a cute name. Oh, I love your names! I quite agree with y'all on Gale, Pippin, and Dickon! Oliver after - well Dickens liked the name too. I loved Titus Groan in Ghormenghast but I don't think I'd call my poor child that. Pippin is a lovely name, but for a young child. Can you imagine a hulking rugby player called Pippin or Robin? I think Pippin is a sweet nickname :) Scout made lots of lists--terrific choice. Here is my top 10 post. Hey I nominated you for an award! Please check it out on http://ottilieweber.blogspot.com Congrats!! Pippin is a fun name, and I love Yvaine. Hadn't thought of Lisbeth, but that's a great one! I like Yvaine. But then again, I am the one with the son who has as one of his 4 legal names, KeKumu'mau'o'ka'lani! Georgia! Lisbeth! Dickon! You've got some great ones I hadn't thought of. Nice list. I love Yvaine! Great list! Oh, Dickon is a good one. He was such a gentle, kind soul, wasn't he? Good call on Scout and Pippin, I love those names (and the characters too). I haven't read Stardust, but Tristan and Yvaine are fabulous names! Scout is such a cute name! I chose Atticus from the same book. Oh I really like Pippin and Tristan. I think my mom actually wanted to call me Pippen when she was going through her Harlequin Romance fase. Hehe! Great picks! Love it! How fun. What a great list; I'll have to think about this one myself - I especially like Georgia and Rhett - I don't know why; they just sound so cute for a lil kid. I also love Atticus from To kill a mocking bird.